Zirconium implants have the potential to become the alternative to titanium implants. They are not yet widely used due to the smaller amount of scientific evidence that exists compared to titanium implants. Dental implants made of zirconium dioxide have been available in the market since 2004. Their high biocompatibility and osseointegration capacity was demonstrated through a series of clinical and animal studies. The first zirconium implants were one-piece implants, which represented limitations from a prosthetic point of view, where the separation of the implant body and the abutment we place on top is preferable. 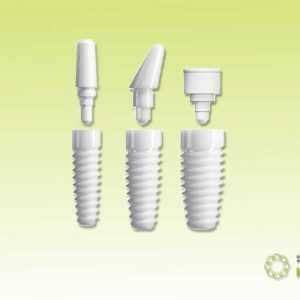 Thanks to new innovations and studies, new models of ceramic implants have been put on the market, these implants are two pieces and they are made with a novel system to connect the pillar with the implant, which represents an advance and an advantage at the time of placing the crown or prosthesis on the implant. These implants are designed and produced to mitigate the risks of fracture and instability. They go through strict production control processes to guarantee exceptional quality levels. Each of these implants must pass a 360º mechanical strength quality test before being packaged and distributed. Zirconium implants are contraindicated in patients who show a lack of compliance with post-operative instructions, such as smoking, physical activity, sunbathing, not complying with the medication guidelines indicated by the surgeon, among others. . It could also be considered a non-optimal patient for the placement of these implants those who have loss of vertical dimensión and / or severe bruxism. Zirconium implants usually have a higher price than titanium implants, due to the complexity of their placement and the necessary expertise of the surgeon. To know if you are a suitable candidate for the placement of zirconia implants, you must make an appointment with us and thus be able to perform the necessary tests. These tests, which do not differ mcuho from those performed for the placement of titanium implants, are complemented in Happy Clinic with tolerance tests or specific biocompatibility that each patient can have for each material. These tests can be performed with Kinesiology techniques or Bioresonance testing. For more information about it contact us through 932170173.